Principle objective of this lecture is to presentation on Introduction to Database Management Systems. Database management systems (DBMS) is an accumulation programs that means that you can store, modify, and extract information coming from a database. 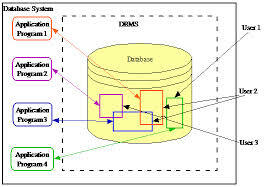 There are many different types of DBMSs, which range from small systems that are powered by personal computers to be able to huge systems that are powered by mainframes. Here briefly describe following examples of database applications: computerized library systems, flight reservation systems, automated teller machines and computerized parts inventory systems.